John was born in Cheyenne, Wyoming and moved to the South when he graduated from the University of Wyoming in 1976. He immediately took a position as Store Manager for a McDonald’s franchise owner in Vicksburg, MS. In September 1976 he flew home to marry Sheryl Martens and brought her back with him to start their life together. After 18 months he began his insurance career with Traveler’s Insurance Company in Jackson, MS as a Production Manager for the Northern half of Mississippi. A promotion with Lamar Life Insurance Company brought him to Baton Rouge, LA in April 1984. He obtained his Insurance/Financial Designations of CLU and ChFC shortly after moving to Baton Rouge and served as President of The CLU/ChFC Chapter in Baton Rouge from 1991 to 1992. John continued his involvement in the Insurance and Financial Services business until the latter part of 1999. In early 2000 he choose to make a major career change and began his involvement in the sign business. He started that career with a national sign manufacturer who made ‘franchise’ quality signs for Small Business Owners. John traveled for that company throughout the states of LA, MS and TX. He was promoted to District Manager for them in early 2001. In the latter part of 2002 John began to develop ‘factory’ connections with numerous national manufacturers. 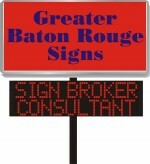 In the early part of 2003 he choose to set up his own company that is now called Greater Baton Rouge Signs. He has attended several national factory’s schools and training sessions.